This is the style that we are kind of going for. We LOVED this house. And it faces a lake. Happy Monday everyone! The weekend went by way too quickly and of course I'm not happy about it. I still have so much to do and don't feel like I accomplished much. This weekend we did a lot. We looked around on Sunday to try and think of possible areas that we want to buy in, and we found a couple that we like. We pretty much know what kind of house we want (we are pretty open, but love older styled and southern style homes). We're still unsure about how much we want to spend, and I guess it all just depends on how much we are able to save. It also depends on whether we want to go all Young House Love and renovate the house ourselves and make it perfect for us, or just buy something that someone else liked. I'm still not sure what I want to do! Oh yeah and we don't know if we want a house that's in an HOA or a home with a lot of land. I have a feeling that buying this next house will be a long process, and much longer than when we bought our first house at the age of 20. Anyone else feel like this the second time around? It's just that nothing seems perfect and what we're exactly looking for! I guess I should probably make a post soon that details everything that we want or need, and then I can makes references to that whenever I need to. What do you think are “needs” with the house that you buy? Let me know because there could easily be something that I'm overlooking. We want to live in our next house for awhile and don't want to forget anything. I'm still looking for possible guest posters as well. Since I am kind of close to paying off my student loans, I’m thinking about starting a debt payoff guest post series. Anyone interested? Topics can be about what you’re doing to pay off debt quickly, how you’re paying them off, whether you think your debt is good/bad, etc! 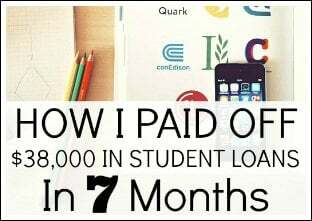 A post that is somewhat related to the topic of debt is great. 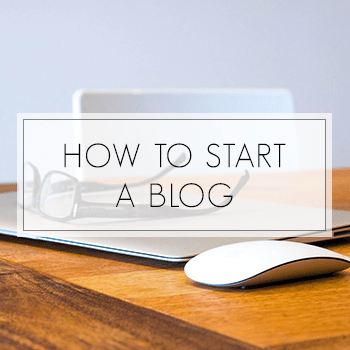 I've also been constantly updating my blog post from the other day on How To Start A Blog. There are now added tips and instructions so that you guys don't get too confused when starting your blog. I also have several other posts about blogs in the works, including how to transfer your blog from Blogger to WordPress. Also, don't forget to check out my sister's blog, FITnancials. I'm helping run it, while she is the writer. This blog has been going pretty well and I'm still excited about it. My sister is a new writer but seems to be doing well. She's still learning about the whole blogging thing but is starting to get the hang of it. She recently became got a Page Rank of 2 (read my post on how to increase your Page Rank) from the recent update as well! I don't think we bought anything in the past week, at least nothing that I can think of. The $1,635 was for the first 10 days of February. This does not include the $325 from my sister, payments that I'm expecting or any affiliate income. If you add up just the $1,635, rent payment and some additional affiliate income which will come by check (I don't want to count the expected payments until I actually receive them), then I have made $2,420 for the first 10 days of February. I do feel like like I'm on a slow start for February so far, but I don't think I'm doing bad. Hopefully I can start reeling in these payments that I've been waiting for! 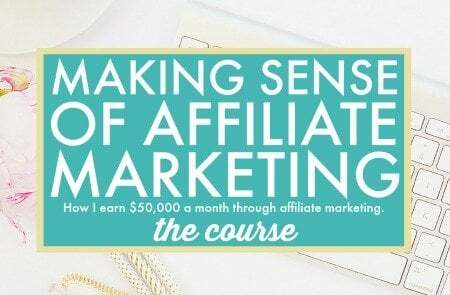 I'm still working on my affiliate income as it's one of my main blog goals for 2013. 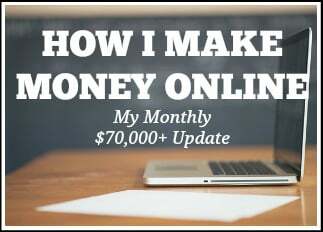 For now, will you tell me if you do affiliate income and what I should know? Any tips, opinions, etc. would be awesome. This was our Friday night dinner. 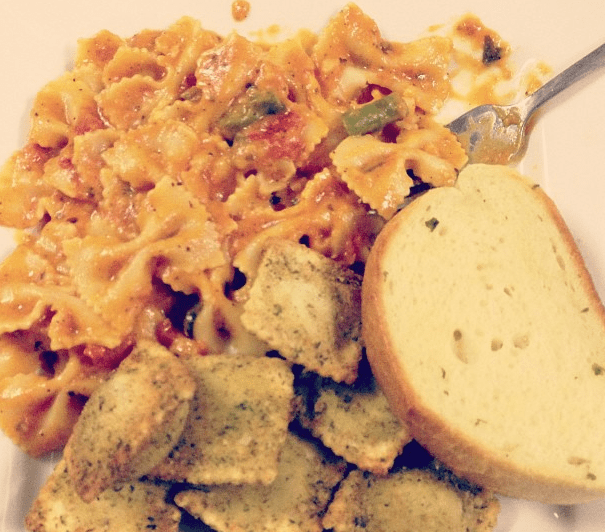 Chicken in vodka sauce, toasted ravioli and toast. YUMM! No meal plan for this week, but we have been doing really good with eating at home as much as we can. We also ate out a couple of times last week, but we had a coupon for every time. Buy one get one free dinners at all of our favorite restaurants? We'll take it! Thankfully it was W's birthday last week so we got tons of free coupons. Nothing new with the wedding right now. We finally have decided on photographers. I love who we chose and I'm super excited! Now we just have to get everything else on track, which there is a lot. I don't feel too rushed though, and I'm not really worried. Our home gym in our basement is complete! The treadmill came in last week and we put it together. Took around 2 hours for us to put it together but it was well worth it. We thought about paying the company to put it together but we decided that it was not worth the extra $250 to pay the company to do this. One thing that we didn't really think about when we bought our home gym was making sure the ceiling was high enough. Yes we measured the height, but didn't measure how much room we would actually NEED. So even though the home gym fit, we can't actually do pull ups on it because the ceiling is so close (but come on, I most likely would never do a pull up anyways). So this also means that if a giant wanted to run on my treadmill, they would be out of luck because there head would most likely hit the ceiling. Luckily I am only 5'4″ and have around one more foot before I hit the ceiling when I'm running. I've only ran on it twice so far, but I have been swamped with things to do so I will blame it on that. My goal is to run on it 5 days this week and most likely at least 5 miles each time. Wish me luck! Our biggest need when we were house shopping was location. I needed to be within an easy jog of the beach. After that, it was all negotiable. 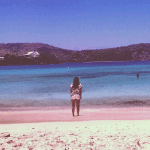 Being near a beach isn't really possible for us, but I wish it were! Living in the Midwest does have its downfalls in that area. 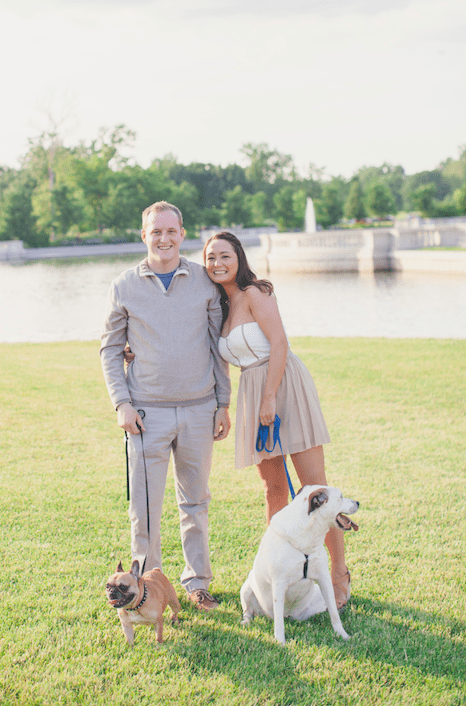 I got sick of getting our first house – i'm not sure I could do another one. It looks like a pretty slick gym setup there. I assume the TV is in front of the running machine? Our first house was so easy, and we know we didn't spend enough time looking and thinking about it. And thanks! Yeah there's a TV across the room. It's kind of far, so people will probably have to squint while running. 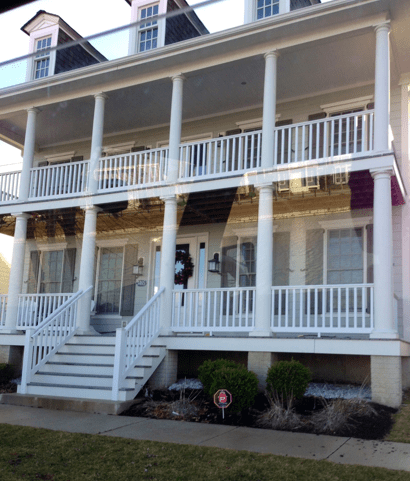 LOVE the pic of the house you showed, Michelle! The best piece of advice we got when house hunting was to think "If I had to live in this house forever, could I?". Don't buy something assuming you can just sell if you get sick of it, b/c you never know… Also, think long term: Will the house work if you: have kids, when you're old, have pets, etc., etc. Try and think of all the scenarios not just in your life now, but what might come later, and see if the house works for you. Love that meal, BTW – It looks delicious! I know I love that house! Those are all great tips. When we bought the house we currently live in, we knew it wouldn't be a forever house. We DO love our house, but we want something bigger. I'm looking forward to your post about converting from blogger to wordpress. I've been considering it for a time, but haven't had the guts to go for it. As far as house goes, while there is a lot to consider, I agree – location! Check it out at different times throughout the day, find out how long your commute is, is it close to shopping, restaurants, etc. Also, maintenance. Big yard? Lots of landscaping? Siding that will require lots of maintenance? Let me know if you think of any questions or ever want a guest post coming from a realtor’s point of view! Luckily, we already know what area we want (it's the same neighborhood as W grew up in). Now we're just waiting for a house to go up for sale there as maybe only 1 goes for sale every year. UGH! I think home buying is so personal but for me, my next home we I will likely build since this home was very much a DIY,reno home…fun but exhausting to live through. I will need a well laid out kitchen with good storage/pantry/cupboard space. A large entry way with a nice sized closet or mudroom. Either a large shed or ideally a garage. 3 bedrooms for my family and an additional room for hubby's home office and guests (we'll likely invest in a murphy bed for this room), carpeted bedrooms, hardwood/laminate/engineered wood in main living areas… I have a long list and pretty much know exactly what I want after living here and NOT having this stuff. I love my home, it's a great first home but not ideal for my family long term. My spending is off to a good start. 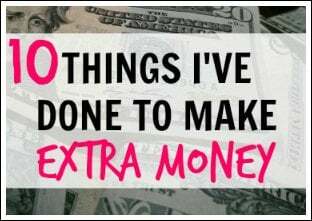 And working the extra income hopefully February can bring something good to me! 🙂 It looks like your extra income and spending is going well too! Good luck looking for the right place and home to buy, pretty exciting!! 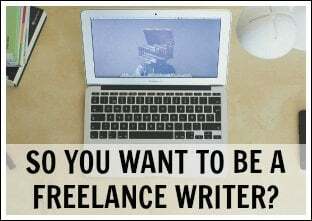 My recent post Getting Started Freelance Writing: What You Should Know. When we start looking for a new house (or if we start looking) I will probably want to be on water. I love lakes and rivers. The good news, we will probably end up buying the family cottage (or one of the other 3 plots next to it) in southern Indiana on the Ohio River. Granted the Ohio isn't great for swimming and boating, but it is a body of water. Other than that I am pretty easy going on what I look for. I guess my only real need is a garage since I hate having to defrost my car in the morning. We are thinking about possibly buying a house on a lake as well! A full basement! As a midwestern kid, I'm always flabbergasted that homes in other regions don't necessarily have basements. If I ever have a full home, I definitely want one! If I were shopping for a house right now, I would look at the schools in the area and the 10-year plan for the community, if you can find it. That should tell you what developers want the area to look like in the future and the kind of population growth that's projected. I know what you mean! We have a finished basement now, and I don't think I could ever move into a house that didn't have one. I'd love to guest post for you, if you're interested. I have a PF series on my blog. If you like it – get in touch! Let's see what's on my list? No advice on the home thing but I love that stye. But advice for the treadmill, 5 days/week of running is a lot. Try to mix it up with other kinds of workouts (like Nike Training Club-free app on iphone) or yoga. I have a feeling you'd get bored and it's also hard on the legs. Yea I wan to hear all about the home search. It’s so exciting! 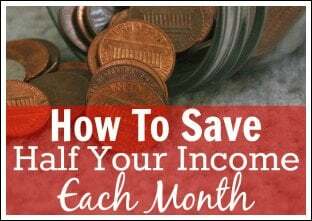 I would love to do a guest post a out getting out of debt. I will email you. Happy Monday. Looking forward to your email. Thanks! 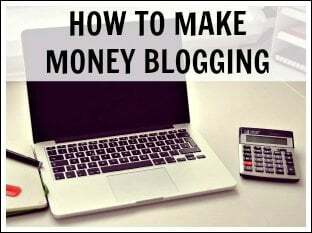 I love your idea of hosting a debt payoff guest post series, Michelle. It's always fabulous receiving different perspectives and inspirational stories from those grappling with debt. Let me know how that evolves! When we buy our next home, I would want to make sure it is large enough for entertaining. Right now we live in a smaller home that cant hold a large group gathering and would love to throw christmas/thanksgiving parties without everyone cramped. Are you planning on renting out your first house or selling it? I agree, I definitely need space for entertaining. And we haven't decided what we will do. It's a tough decision. We haven't bought a house, but when we do, here are a few of our must-haves: walk-in closets, double sinks in master bath, open floor plan, LOTS of natural light! I agree with your list! There are just so many things that I want. When looking for a new house, look into the school districts. I know you're only 23 and don't plan on having kids for quite awhile 🙂 But if you are looking to stay in this next house for the next 20 years, this is something to think about so you are prepared. We definitely plan on looking at school districts. Thanks! After six months in our first home.. we're already talking about our second! Not that we're planning to buy our next place soon but as we've been making some changes and improvements to our place we've mentioned what we want the next place to have. We've also discussed building. Our next house needs to have a bathroom on the main floor (we currently have 2 full baths, but one is in the basement and one is on the second floor), attached garage, a pantry and more food prep space in the kitchen. We chose to buy a house situated between my husband's office and my office (in opposite suburbs) and it works out that the location makes working anywhere in the metro area possible. My husband got a job much closer to where we bought our house so our next place won't NEED to be "in between." We have a lot to think about for our second home. We want a ranch style home and they are very hard to come by in our area. After the style, it is all about the neighborhood for us. We have a ranch style home right now, but I think we want a 2 or 3 story now. And we agree, first it's style, then it's neighborhood for us. I love that style of houses and the lake proximity is really cool! prices look very cheap where you are, you sure will be able to get a fantastic house! Thanks! And yes I hope we will be able to find something. 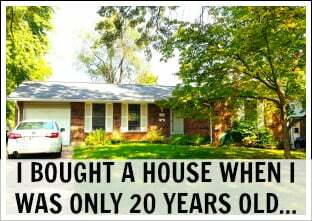 Congrats on purchasing a second home so soon! I got my first couple years ago and will probably be a while, if ever, before I get a second. For my first I remember having a list of requirements but because inventory was so low here it I had to let some wishes go. I know we won't be able to find our perfect home, but I do hope we find something close. Forget the second house and buy a sailboat! Come on Michelle, you know you want to! 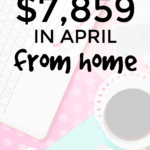 Seriously though, you're crushing it with your extra income and blog. Keep up the good work! Haha yes I know we can't decide what to do! Frankly, I'm at rock bottom. 10 months of unemployment in 2011 drained my finances dry, then after 1 year of employment I was only able to pay off some of my ongoing debt (from college, car accident, etc) and my savings account was drained after a medical emergency, then I got laid off again 5 months ago and have been subsisting primarily on unemployment benefits (I managed to save 2 months worth of bill pay amount, even still, but the IRS just took that for 2012 taxes). My unemployment benefits run out next week, and despite applying to over 100 jobs, I'm no closer to have a job (even part-time, even low-paying). Panic? You betcha. I'm grateful that I had the money in my savings account to cover those emergencies, and that I've been able to make progress with my debts over the past several years (although have only managed to pay off 2 of the 9 separate debts), but I'm very frustrated and depressed about the fact that I can't ever build a nest egg of savings. I'm envious that you can and do (and well done! ), but the info I need right now is how to make money enough to pay the rent, when you are unable to get a job. Help? I'm sorry Beth. Sounds like you haven't had the easiest couple of years. I would say keep applying for jobs and doing your hardest to land one. Are you using cover letters, preparing for interviews and everything else? I'm assuming you are so this is tough. Thanks for the update! My needs for a house now are different than they were back in the day, meaning that I would buy a WAY smaller house now, even with 2 additional kids! That's just where my head is at right now. Nothing wrong with that. We're still unsure if we want a huge house or something just a tad bigger than what we have now. Buying a new house is exciting and overwhelming at the same time. When we were looking for our second house, we must have looked at 75 or more! None of them matched exactly what we want. What I would suggest is finding the home that meets most of your wants/needs while making sure it has the potential in the future, after a little work on your part, to make it into exactly what you want. If you are going to have children in the future, look for a place with a yard big enough to add on to the house if you need to. That is what we lacked in our first house. And, though we loved our first house, we had to move to acquire additional space. We will most likely look at tons of houses too. Haha 75 is a lot but I'm sure we'll be around that number. And thanks for the suggestion, will definitely keep that in mind. How exciting, buying your second house! Good luck with the search! 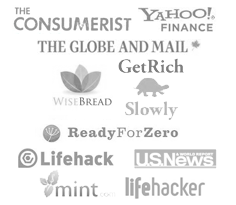 Do you plan on sharing a breakdown of your online income? 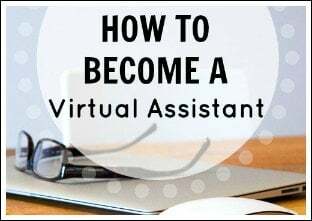 You lump affiliate income, virtual assisting, and others into this category, right? The numbers you are putting out every week are pretty inspiring. I hope to do the same myself. So far, everything (spending and working out) goes according to plan. But I just got word that two of my friends are getting married later in the year, so I may get stuck shelling out money for a trip. They're good friends, so I should probably attend. But I need to start tightening the screws on my spending so that I can still make my savings goals. We need to start tightening our spending as well! There are so many things that we need to save for. A slow start at $2400, I love you are making so much money that seems slow. We built a house in 2004, and the garage seemed huge because we'd never had one. It gets full fast, so I would say have a bigger garage than you think you need. We only have a 1 car garage now, and we know that we would want at least a 2 to 3. 1 is just too small! House with some character, not a cookie cutter style row houses. at least half an acre land. We do not want a house with HOA, and/or needing major upgrades immediately. Good luck with your house hunting and wedding preparations! That food pic looks so delicious! We're trying to decide where to "settle", but I agree with location and not having to drive a 15-20 minutes just to get to a main freeway like so many places in SD (even if it does mean a bigger house). Good luck with the search! Maybe it's me but I can't stand HOA's and prefer land. That's the main reason that I live in a rural farming community. The nive thing about where I live is that it's only 30 minutes away from downtown Raleigh and 40 minutes away from the Research Triangle Park. So even though we live in a rural area we can easily commute to work or hit Raleigh up for a nice restaurants. 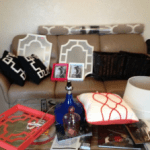 I love the style of home you're considering, very beautiful. For us, what mattered most was we knew what city we wanted to live in. 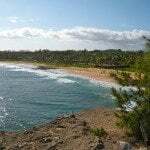 It had to be a safe neighborhood within that community with a great school system (even though we didn't have children at that time), walkable distance to beach (hubby is an avid surfer and we love the beach) and most importantly – affordable mortgage. We could have bought a larger home (sometimes we probably wish we did) but it would have cut into our "fun" money. We love traveling and we weren't willing to give up our "fun" money for a bigger home. It's definitely a balancing act and knowing what matters most to you. 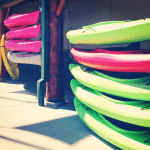 We love our home and can still take lots of mini-trips and one big family vacation. Thanks for stopping by my blog. This is something that we're trying to decide as well. Should we get a big house that cost more or something smaller that we can pay off quickly? Great update! I love hearing about all of the progress you are making. We are currently building a new home and our main focus has been keeping monthly costs as low as possible. One of the nice things about buying a new home as opposed to an older home is that you can focus on adding a lot of the "green" perks and advances in construction technology. Good luck, I know buying a home is stressful. My recent post The Grocery Game Challenge Feb 11-17 Stock-up When You Can! Pancake Day! 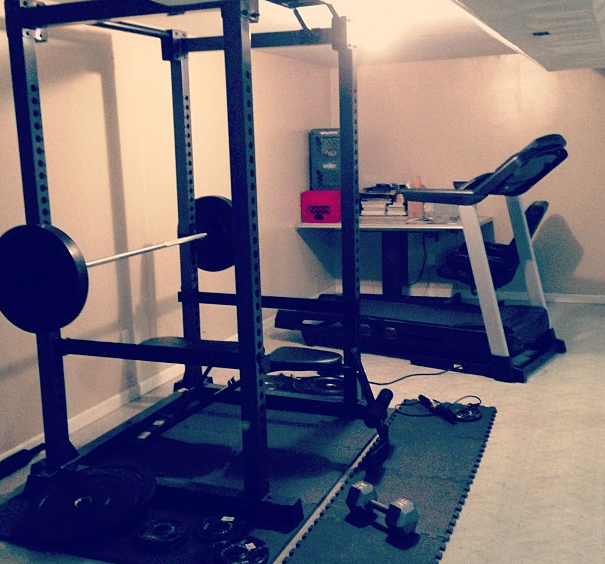 I love the home gym. I built one for my garage it helps out tremendously! I love the style of that house! I`ve always had a fondness for American architecture, as i find them more charming and much nicer than what I`m used to. 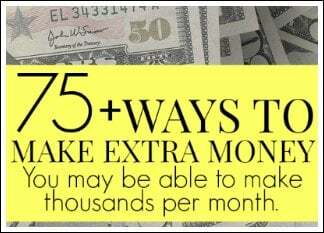 and wow, that`s a great extra income! congrats!